Good Friday marks the day Jesus died to pay for the sin for all mankind. We call it “good” because He took the punishment that we each deserve. But on that particular day the Christ-followers couldn’t see the good at all. How could they? They had put all their hope in the rabbi that was just brutally killed before their very eyes. It makes me think of the day my daughter died. Excruciating pain. Heart-wrenching fear. Unfathomable confusion and anxiety. There is not much good in grief. Jesus returned from the dead and joined His disciples as they were walking home trying to console one another. They didn’t recognize Him as they shared their woes about what happened. When Jesus explained how the prophecies were actually fulfilled, they appreciated His wisdom but they were so caught up in their sorrow that they didn’t even realize it was Him. That’s where I was, too, that dreary day in March 1999. When Jesus broke the bread to serve the disciples, their eyes were opened to His presence. God did help me just as He did the disciples. 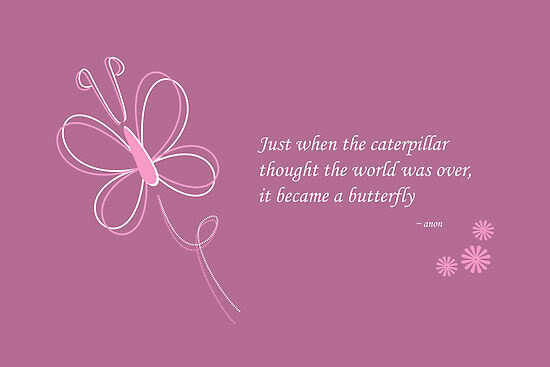 If you are dealing with a difficult season in your life, hold on. This weekend marks the anniversary of our daughter’s death. Rebecca was a Trisomy 18 baby who’s three weeks of life far exceeded the doctor’s expectations. If you have ever lost a child, you know there are many questions that torment you throughout the grieving process. For me, one of the hardest ones was, “would she remain a baby in Heaven or would she grow up there?” Before I could move on with my life, I needed to know if I would recognize her when I reached Eternity myself. I searched the Bible tenaciously until I finally found my answer. When Jesus returned to His disciples after His resurrection, they did not recognize Him until He showed them His scars. It seems to me that a resurrected body is healed and whole–but it is the same body. My heart has settled on the idea that maybe Rebecca will remain a “baby” for eternity (though I am sure that she will not be held back by any physical or mental ailments). This brings me great comfort because I cannot think of anything that contends with the joy of holding a baby, and I feel as though I see a glimpse of a bigger picture. Right after Rebecca’s death I lost my business partner to lung cancer. Janice never had children. I can’t help but wonder if God wants babies in Heaven to complete His family there and bless those who missed out here. I do not claim to understand it all, but one thing I believe with all my heart: Some things we just cannot understand because we do not have the whole picture, but we can trust the One who does. Maybe the things that break our hearts while we live here on Earth were actually designed to bring us great joy for all eternity. God, would you help us with the things we just cannot get our head around? There is so much we don’t know, but we thank you that we can put our confidence in You and Your character. Amen. When a child suffers or dies, caring people are affected. It doesn’t have to be your child, or your family member for you to feel the grief. If you care, you hurt. Of course the pain is far more substantial for the parents and those who love the one afflicted, but somehow difficult stories become public and even strangers hurt. When I lost my daughter, the publicity was difficult at first. I didn’t want to be the subject of strangers’ conversations or the charity case for their meal drives. I wanted people to leave me alone and let me deal with this myself. I felt as though people were using their knowledge of me as their bragging rights to my story or their generosity. It was a friend of a friend who brought me to a breaking point. She walked into my house with her beautiful meal in hand all in a huff. She was overwhelmed with her own life and adding another family to her meal plan and finding the time to run it two towns over to me was no easy task for her–and she made me very aware of her great sacrifice. I tried to enjoy her guilt offering that night, but I couldn’t suppress the frustrations of being a burden to my community. My family and I are independent people! We take responsibility for our own needs, we like to be the ones helping, not the ones needing! I have an amazing husband who shows more grace than anyone I know. This wasn’t easy for him either; he is a very generous man who would give the shirt off his back to his enemy without a thought of himself, but he knew that with giving comes pride and being needy is the best antidote for that. As I shared my frustrations with him, he taught me to submit to the condition we were in, and allow others to help us, that this was simply a season and we should let people be part of it because they care, even if they do and say things that are way out of line. We need to look at people’s hearts, not their actions or words. Child-loss is a huge challenge and no one knows what to do or say. And really, one day certain words or actions might be helpful, another day they may be hurtful. It’s no ones fault that our emotions are irrational; it’s life. We are all human, we mess up, but more often than not we do not intend to. I know I have said the wrong thing to another grieving mom, and I’ve been there–I should know what helps! I can only hope that when my words or actions hurt others, that they too have learned that we each have a choice: we can take things personally and let our offenses rob what strength we have left to get through our challenges, or we can look at the heart of our offender and believe that they care and do want to help, they just are struggling with their own issues and don’t know how to do it well. After all, that’s what Christ does for us. 2 Peter 3:14-18 So then, dear friends, since you are looking forward to this, make every effort to be found spotless, blameless and at peace with him. Bear in mind that our Lord’s patience means salvation, just as our dear brother Paul also wrote you with the wisdom that God gave him. He writes the same way in all his letters, speaking in them of these matters. His letters contain some things that are hard to understand, which ignorant and unstable people distort, as they do the other Scriptures, to their own destruction. Today would have been my baby’s 13th birthday had God granted her the time. He didn’t; He gave her only three quick weeks of life. Rebecca was a Trisomy 18 baby with many physical challenges that gave her a 95% chance of being stillborn. I was blessed to hold my baby 21 many more days than other Trisomy moms; how could I complain? Today I have been preparing our traditional fish dinner and setting out little keepsakes for my three other children to remind them again this year that though I miss their sister, I celebrate them on her birthday. Rebecca’s short life had a big impact on their lives. That is not a bad thing. It is good for them to have a story to tell, especially if it encourages others. nk that my testimony was nothing to offer because it was so simple and pure. Now I feel the pain I have suffered has brought much value to my story. I wouldn’t trade my sorrows for the world. In many ways I think of my loss as an honor. I do not like being the center of attention, but it seems to me that the difficulties, caused others to watch us, which gives us an opportunity to shine and bring hope and courage to our onlookers – who may not have ever noticed us otherwise. The process of grief has shown me that life isn’t all about me. I want God to get the glory in all I do, and if it means being humble enough to let others look, and vulnerable enough to share my heart, even at the risk of criticism or pity, then so be it. I don’t want to waist my pain. 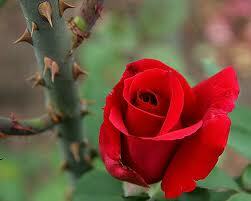 In order to give others the most beautiful things in life, sometimes we must hold a stem full of thorns. Let’s do it anyway.